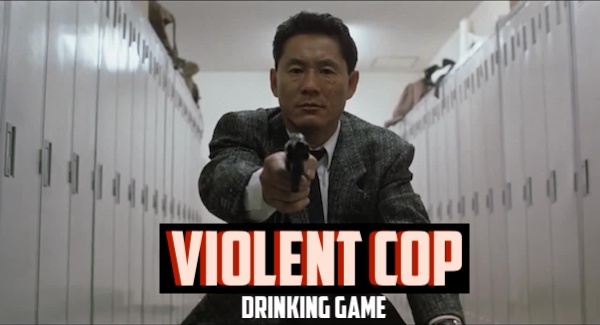 Violent Cop is the first film by Takeshi Kitano. Originally Kinji Fukasaku (Battle Royale) was scheduled to direct the film, but ultimately had to pass due to scheduling issues. The studio then approached Kitano with the opportunity to direct the film and allowed him to create Violent Cop at his own pace. The film was not a success, but it did set the foundation for Kitano’s prestigious film career. Violoent Cop is currently available on Amazon Prime. there's a gun on screen. Take a big gulp during any random or unexpected moments of brutal violence. Take a shot right as the second ending begins, so you can forget it even exists. *NOTE: If you like the movie, this will help you deal with the freeze frame and credit crawl on a desk secretary. Good luck and remember: Don’t! Get! Eliminated!